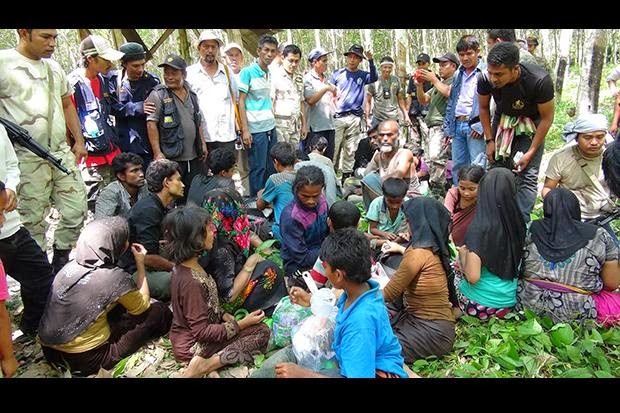 SONGKHLA — Twenty-six more Rohingya migrants abandoned by their traffickers two weeks ago and left to wander in the jungle were found on Khao Kaew mountain in Hat Yai district on Monday. The latest discovery increased the number of undocumented Rohingya found in and helped out of jungles along the Khao Kaew range in Sadao, Hat Yai and Rattaphum districts of Songkhla to 256 as of today. It came as security forces and local officials continued to search for more illegal migrant detention camps in Songkhla and other sourthern provinces. 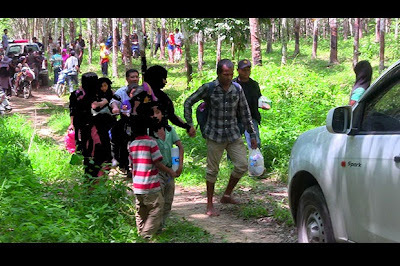 A search team discovered the 17 males and nine females, six of them children, walking in a rubber plantation at Ban Na Kuan village in tambon Chalung. Some of them are in the same family. They told the authorities, through an interpreter, that they were supposed to have been taken across the border to Malaysia, but the smugglers deserted them two weeks ago for fear of being caught and arrested. They had wandered, lost on the mountain, ever since. The Rohingya were fatigued and had only tamarind which they had collected from the jungle for food. A village mosque was being used as a temporary shelter for the 26 Rohingya, who will be taken to Hat Yai district office for nationality screening and further assistance.